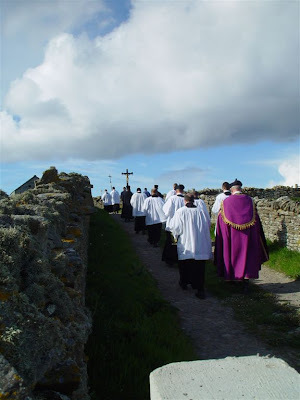 1601st bithday celebrated on Papa Stronsay! Lord, are they few that are saved? May - The Month of Mary! 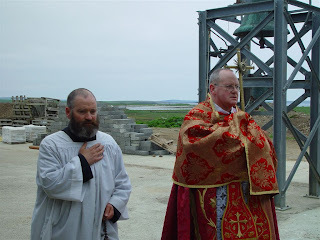 The feast of the Queenship of Mary comes around once again, and with it, the 8th anniversary of the purchase of Papa Stronsay by the Transalpine Redemptorists, and of a new outpost for tradition. How many blessings have we not received from this great Queen? During how many storms has She not come to our rescue? During how many assaults from our enemies, both spiritual and temporal has She not come to our defence? What a great debt of gratitude do we not owe to this Queen of Heaven and earth? 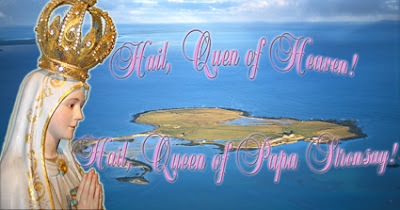 For this reason, and to secure her assistance in future trials, this day, two years ago, Papa Stronsay was solemnly consecrated and given over to the Immaculate Heart of Mary with a procession of Her statue around the Island so that it is now no lie, nor even an exaggeration to say that Our Blessed Lady is in all truth, Queen of Papa Stronsay. The Church celebrates the death of Her saints as their birthday into the better life. 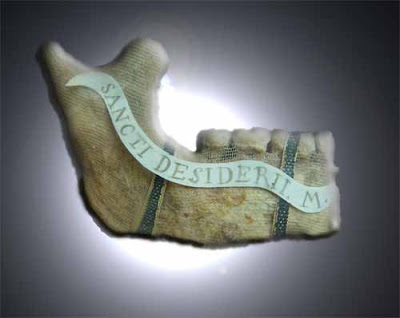 The jaw of this Blessed martyr, which, by reason of the words it uttered, bought down upon him the wrath of the king, resides in the chapel of the Transalpine Redemptorists on Papa Stronsay. When still young he was elected bishop of Langres in France. The Martyrology of Brauntius states that an angel commanded him to accept this burden, and that the spirit of God worked so powerfully in him, that it made of him an excellent preacher of the truth. His prudence, doctrine, vigilance, zeal for souls and holiness were admirable. He assisted, by a deputy, at the council of Cologne in 346 AD, and he assisted personally at the council of Sardica in 343 where he generously supported, with the other Catholic bishops, the cause of Saint Athanasius, which was inseparable from that of the faith of the Church. A short time later the Vandals made their first irruption in Gaul of which St Jerome speaks in his 11th epistle to Agerunchia; and God permitted it to chastise the population for its crimes and to purify the land of the heresy of Vigilance. After having ravaged Gaul the Vandals, in the year 406, laid siege to Langres in Champagne. Saint Disiderius, touched with compassion for his people, sought with many prayers and tears, the mercy of God; but seeing that these were insufficient, since the number of sins had too much irritated God’s anger, he believed that he could find clemency by giving his life for those of whom he was the pastor. He therefore went to find the king of the besiegers and asked him to spare the inhabitants of Langres; but the Vandal named Croscus, was not touched by his entreaties, nor by his heroic charity, and had the holy Pontiff seized by his soldiers. Then, after vainly trying to have him renounce his faith, Croscus decapitated him outside the walls of the city. At the moment when his head was cut off, St Disiderius held the book of the Gospels between his hands. The blood that flowed in abundance from his neck fell on the pages of this holy book without effacing even a single letter from the handwritten text. Then, by the judgment of God, Croscus lost his mind, and he ran around the walls of the Langres screaming, until he rammed his head into the gate of the city so hard that his brains were smashed, and he died in front of his followers. This caused such a great fear that the army ceased their atrocities. Shortly afterwards the main city of King Croscus, Arles, fell to his enemies. Then the body of the saint stood up by itself, took his head into his hands, and walked to the place within the walls of the city where he wanted to be buried. His relics were translated on 19 January 1414, by William de Durfort, bishop of Langres, to the Saint Magdalen priory which took the name of Saint Dizier (Disiderius). Gui Bernard, bishop of Langres, ordained the 23 May as the feast of Saint Disiderius. 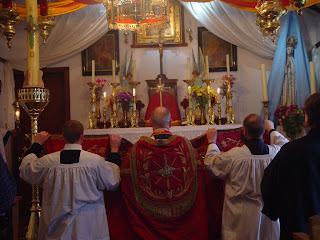 SANCTI DESIDERII ORA PRO NOBIS! 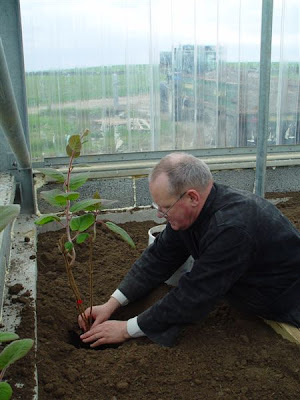 For a long time we have looked forward to growing some Kiwifruit. 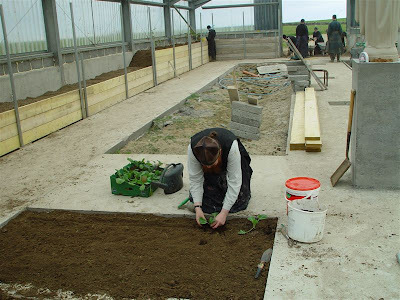 Brother Nicodemus Mary prepares the cabbage patch. 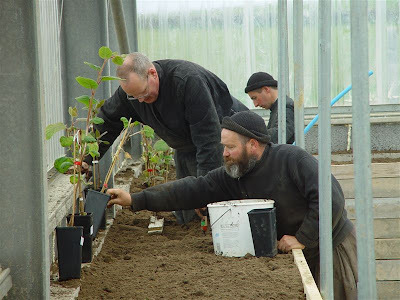 Planting the Kiwifruit continues..... the first fruit is expected in three years time. 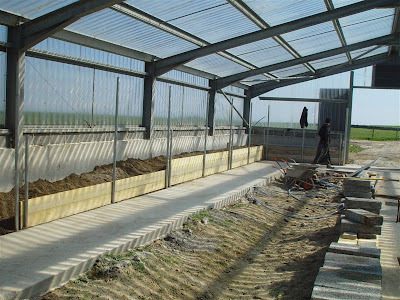 Now it is barrows of sandy soil for the raised bed and the floor beds. 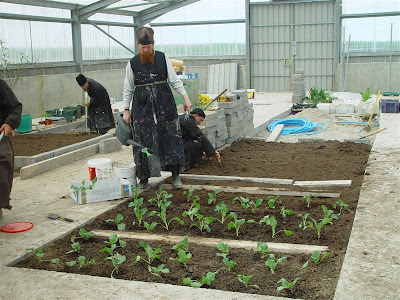 As the raised bed develops Brother Nicodemus plants the first cabbages. 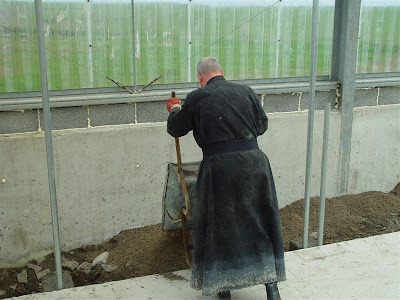 The cabbages are on their way in the background Brother Roman prepares the flower bed to give flowers for the altar. 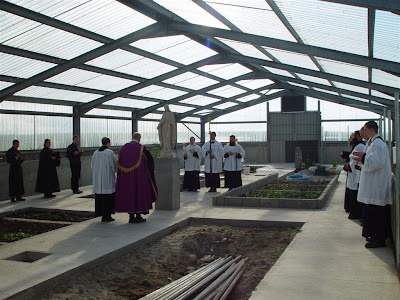 Today we worked and prayed many rosaries together. 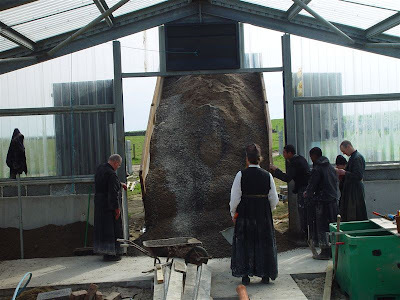 The shingle and sand together, barrow after barrow, Hail Mary following Hail Mary all the way to the: Glory be to the Father and to the Son and to the Holy Ghost. As it was in the beginning is now and ever shall be, world without end. Amen. 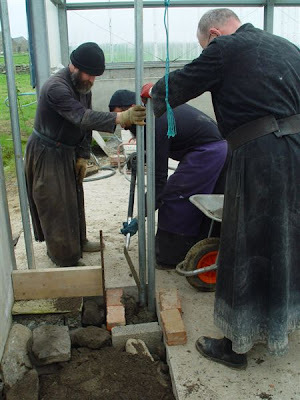 Yes, of course, the noise of the saw should have been drowned out by the Brothers' Rosary chorus..... but... when prayers meet resistance they triumph through perseverance... O my Jesus forgive us our sins, save us from the fires of hell and lead all souls to heaven, especially those in most need of Thy mercy. 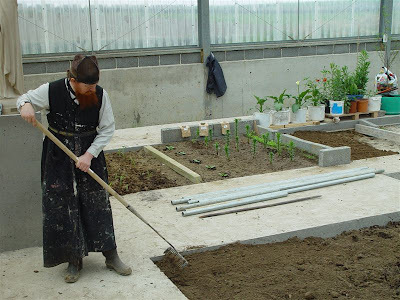 There was Rosary and there was work, the second day.... the raised beds begin to take shape....... in Our Lady's Garden. 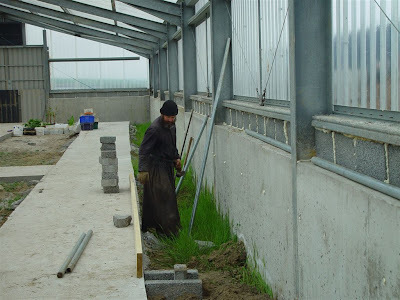 The project of the day: to prepare the raised beds in the greenhouse. 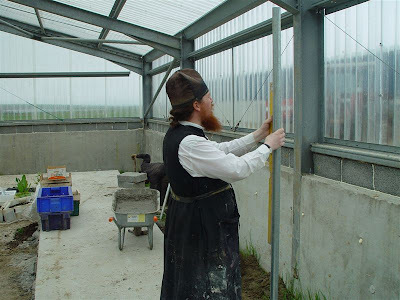 Brother Paul Mary inspects the site for the raised beds: "We're going to need a lot of stones and sand." 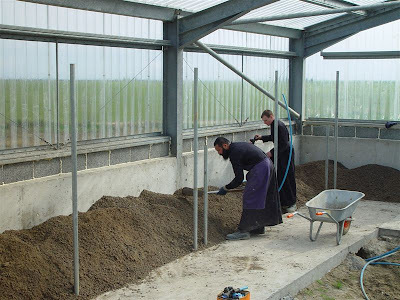 Brothers Rafail and Cyril securing the foundations for the posts. 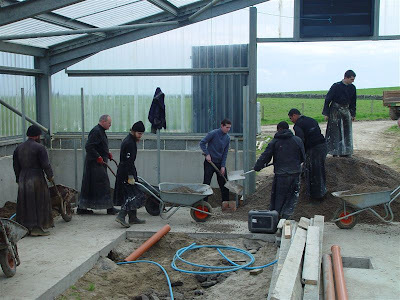 The first pipes go in. 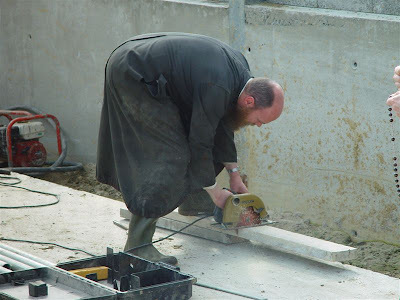 Brother Nicodemus Mary levels and passes the workmanship. 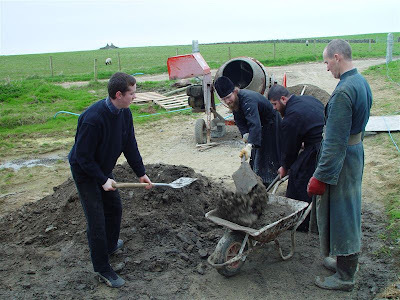 Brother Columba Maria hard at it. "Alleluia!" 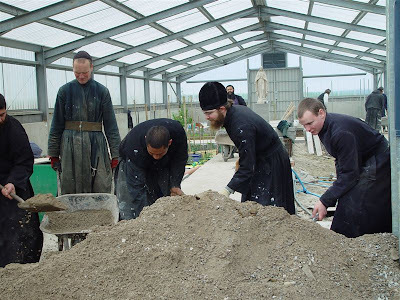 as the pile of stones and sand is reduced. 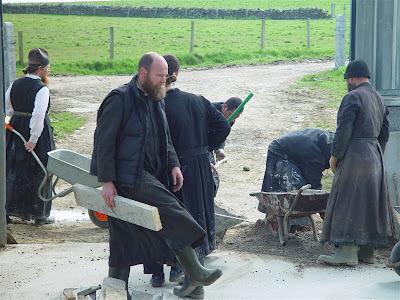 On the job are Dominic, Brothers Roman, Xavier and Columba Maria. Antiphon Ps. 43,26.- Arise, Lord, help us and redeem us for Thy honour's sake. Ps. O God, the tale has come to our ears: have not our fathers told it? V. Glory. Be merciful unto us: spare us, O Lord. That Thou deliver our souls, and those of our brethren, kinsfolk, and benefactors, from eternal damnation. That Thou vouchsafe to give and preserve the fruits of the earth. 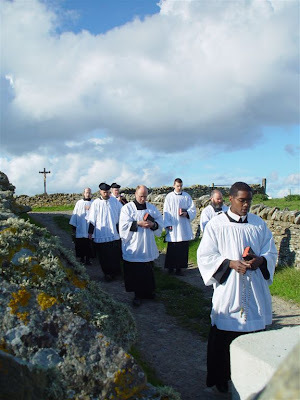 Deign, O Lord, to proceed all our actions by Thy grace and to accompany them by Thy help, that so our prayers and works may have in Thee their first beginning and their last end. With not one canonised saint of the Catholic Church stating the opposite, and a whole litany of saints recognizing and affirming it, this is a truth which should not be passed off lightly. “Doubtless in the heart of each…a fervent desire has arisen to gain admission to the realms of eternal light, and become a partaker of it’s joys. Perhaps each one will feel sure that his hopes in this respect will be fulfilled. It is however greatly to be feared that many a one will come short of the goal and will be forever excluded from the kingdom of heaven” (Fr. 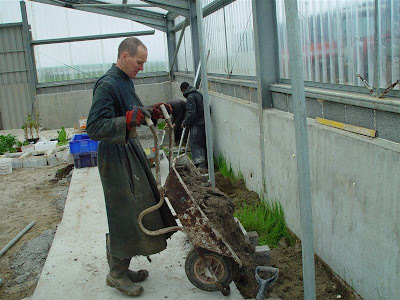 Marten von Cochem, O.S.F.C. "The Four Last Things – Death Judgement Heaven Hell"). What proportion of mankind do you suppose will be found in paradise after the general judgement? Perhaps half? Or a quarter, or even a tenth? Alas I fear that it will be nothing of the sort. We need only look to the gospel of Saint Luke to find ample justification of it: “And a certain man said to him: Lord, are they few that are saved? But he said to them: Strive to enter by the narrow gate: for many, I say to you, shall seek to enter and shall not be able.” (Luke xiii. 24). 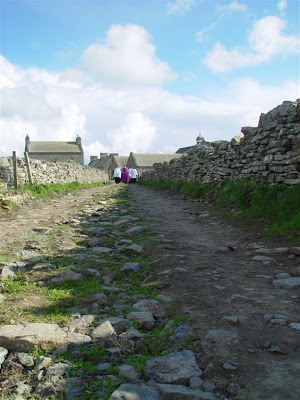 Our Lord Jesus Christ Himself urges us to strive to enter by the narrow gate. He exhorts us to strive, that is to take great trouble, to exert all our powers. If you imagine to yourself somebody striving after something, do you imagine them to be half-heartedly going after it, or showing indifference in the matter? No these people who are striving are determined and motivated to obtain their goal! Yet Our Lord goes on to say that it is of those who seek to enter by the narrow way, that there will come many who shall not be able. 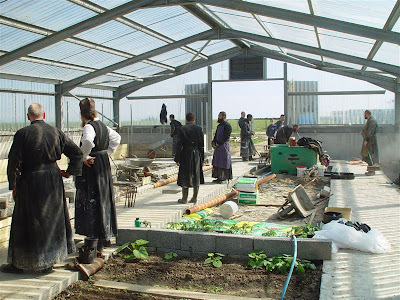 If many of those who desire to enter into the kingdom of God fail to do so, what will become of those who lead careless and perhaps ungodly lives and manifest no zeal, no interest in what concerns their eternal salvation? So what should we take away with us from the consideration of this truth? We should take away with us a great fear of the judgements of God. Not however a dry, barren fear, but a fear which causes us to look at our lives and to root out anything we find there with which God could reproach us on the last day. We should also consider those words of the disciples: “Who then can be saved?”, and Our Lords reply: “With men it is impossible, but not with God…” (Mark x. 26-27). We should then implore the mercy of God, and what better way can be found to influence the heart of God, that the intercession of the Blessed Virgin Mary, the Mother of mercy, and the Refuge of sinners? 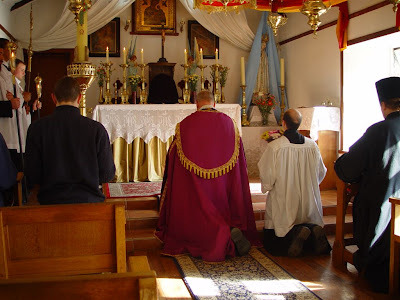 St. Alphonsus Liguori tells us that to ensure our salvation it is necessary to practice a devotion to Our Lady which is constant, that is, that we never omit until the end of our lives. And what does he suggest as a suitable devotion? 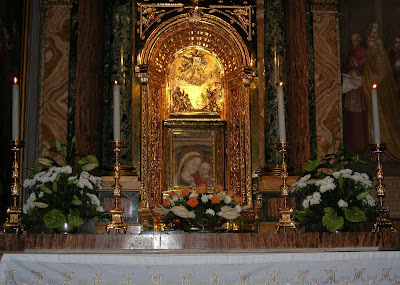 Perhaps to say the ‘Little office of the Blessed Virgin Mary’ every day? Or maybe to pray 15 decades of the rosary every day? 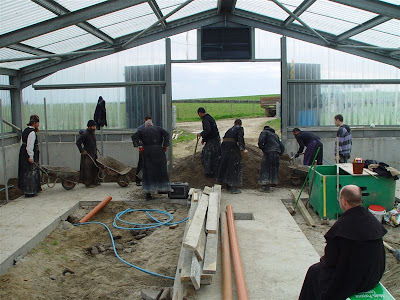 These practices are undoubtedly great acts of devotion towards our heavenly Mother, however it is neither of these that St. Alphonsus suggests. It is merely to pray (if possible lying prostrate on the floor) three ‘Hail Marys’ in the morning after rising, and three again before going to bed, adding the short prayer after each ‘Hail Mary’: “O Mary, by Thy pure and immaculate conception make my body pure and my soul holy, my Mother preserve me this day/night from mortal sin. Amen.” With this practice, so long as we persevere in it until death, day and night, we shall surely be saved. This Stanislaw was a Pole. He was born of a noble family, (on the 26th day of July, in the year of Our Lord 1030,) at (Szczepanow, in the diocese of) Cracow. His godly parents, who had been childless for thirty years, obtained him from God by prayer, and from his earliest years he gave token of the holiness of life, which afterwards marked him. 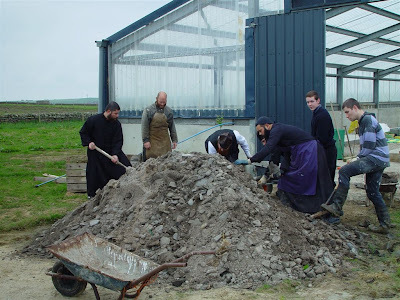 When he was a young man he applied himself heartily to all useful learning, and was deeply read in the sacred teaching of Canons and of Theological science. After the death of his parents he inherited great possessions, but he sold them, and distributed the price to the poor, purposing himself to become a monk. However, by the Providence of God, Lampert, Bishop of Cracow, named him Canon of the Cathedral Church of that diocese, and Preacher in the same: and afterwards, (in 1072,) he was elected, against his own will, to succeed to Lampert’s place. In this office he was a bright and shining light of all virtues that become a shepherd of souls, especially of tenderness toward the poor. At that time Boleslaw II was King of Poland, and him Stanislaw grievously offended, because he openly rebuked him for his shameless lust. 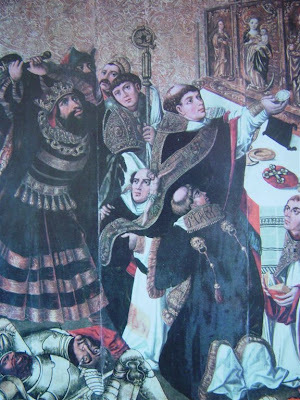 Wherefore, in a solemn Parliament of his kingdom, he made Stanislaw to be brought before him on a false accusation of having taken wrongfully a certain village, which he had bought in the name of his Church. The Bishop could not rebut this charge by documents, and the witnesses were in too great fear to speak the truth. 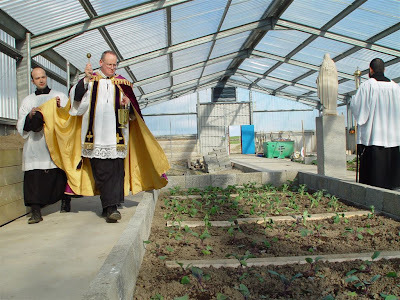 Stanislaw therefore said that in three days he would produce before the judgment-seat one Peter, from whom he had bought the village, and who had been dead three years. His enemies laughed thereat, and closed with his proposal, and the man of God gave himself up to fasting and prayer for three days. On the day, which he had promised, after he had offered up the Holy Sacrifice of the Mass, he commanded Peter to rise from the grave. Peter then immediately came to life, arose, and followed Stanislaw to the King’s judgment-seat, where before the King and all others, who were struck dumb with amazement, he bore witness of the sale of the village, and the honest payment of the price by the Bishop, and then again fell asleep in the Lord. Today we celebrate the ‘martyrdom’ of St. John. Already an old man, St John was possibly about 80 years old, when this incident took place. Titus the Emperor had died and was succeeded by Domitian. Titus was a gentle Emperor, so much so that he was called the ‘delights of the world’. 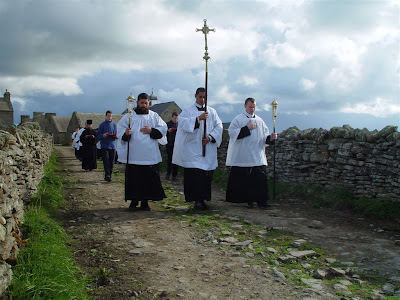 Domitian on the contrary was an evil man and began to renew the persecution of the Christians, which we know as the ‘second persecution of the Church’. St. John had been ruling the Church in the whole of Asia and doing clearly a wonderful job. He was consoling the faithful, bringing them to the love of God through the brightness of his virtues and excellence of his doctrine, which he received from the Heart of Our Lord, as he rested his head upon His breast during the last Supper. Around the age of 80, St. John was forced to go to Rome, to be questioned about his Faith. He was dragged in chains and beaten before he arrived at the court of the Emperor Domitian. Domitian told to him that he must sacrifice before the gods or be himself sacrificed. St John was horrified that someone would ask him to do such a thing. It was impossible for him to do anything against his beloved Lord. With unshakeble faith he professed his love of Our Lord Jesus Christ and stated that he would prefer to die than commit the slightest fault against Him. Domitian ordered that he be burned alive in boiling oil and they prepared a great big pot of boiling oil and had the flames and fire as strong as possible for the oil to be extremely hot. This was all took place at the Latin Gate. 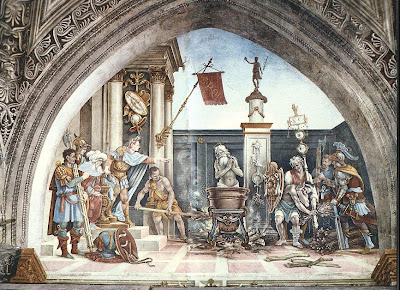 According to the roman ritual, before being thrown into the boiling oil he was beaten and hit with rodes and then he was thrown alive into the boiling oil. But those who love God will suffer no harm unless God permit. When he was placed in this oil it was like a balm that healed and strenghten him and made him to feel so much the better after being in it. 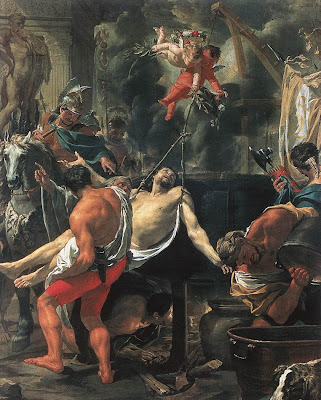 The executioners were horrified at this and therefore tried to increase the fire but all they did was to burn themselves but the flames had no affect on St. John. Domitian was amazed at this and although he never changed his ways he was affected by it and deceided that it was pointless trying to kill St John. Therefore he had banished him to the Isle of Patmos. This then is the origen of todays feast of St John before the Latin Gate, Domitian tried to martyre and kill him. Later on the Isle of Patmos God prepared for him the revelation of Apocalypse. Where, mingled, Water flowed, and Blood. Those holy Limbs should find their rest! Whom by the Cross Thou dost restore. Teach, Oh, teach us how to die. Sing Hosannas to their Lord. To their home of gladness fly. The innocent Jesus hath reconciled sinners to the Father. 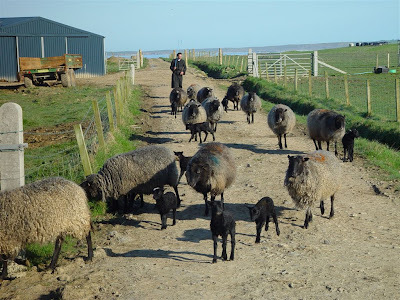 This is the first year that we have had the pleasure of having 16 Gotland sheep on Papa Stronsay- 15 ewes and Frank the ram. 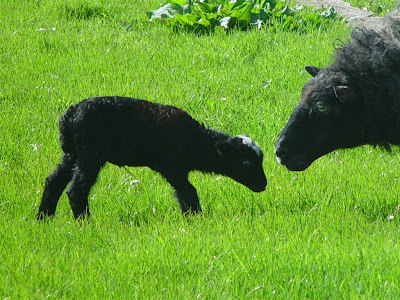 Gotlands are known for their curiosity. They will usually run up to you when they see you near their fence. 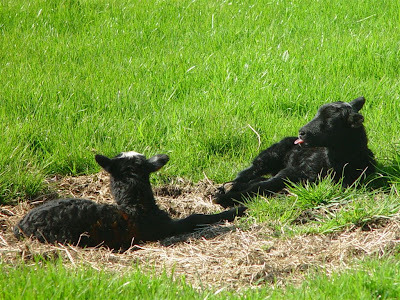 The 15 ewes produced 26 lambs of which 17 are ewe lambs and 9 are rams. 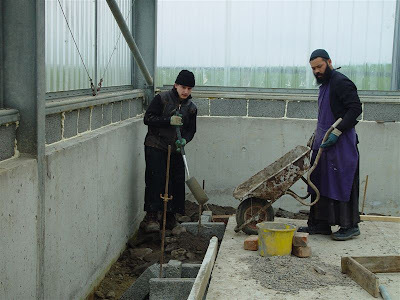 The sheep spent the winter inside the sheep shed, (named 'Bethlehem') and now that the weather is fairer, Brother Louis Marie takes them out to grazing every morning; although at this time of they year they still return to Bethlehem in the evening. The next sheep to lamb will be the hardy Cheviots that are more suspicious of shepherds. We'll see how we go with them when the time comes.